Aralco Retail Systems offers a comprehensive suite of POS interfaces for many electronic devices to fulfill the needs of retailers who wish to enhance in-store productivity and improve their customers' shopping experience. Leveraging the following integrations, Aralco streamlines your day-to-day processes at the POS increasing transaction speed with accuracy, eliminates errors and improves security with better controls in place. Unified credit & debit card payment - Ingenico ICT-250 integration with Aralco POS. All major credit card brands (Visa, MC, AMEX, Discover, and Union Pay) and Interac. Contactless/Tapped transactions, Apple Pay - now available in North America and coming to Asia in the near future. Dual display screens offer customers full view on in-store advertisements and transaction-in-process areas at the point of sale (POS) station. In-counter bar code scanner interfaces are available on selected models from Magellan SL, Honeywell, Ohaus Adventurer. Five-sided, 360-degree scanning increases productivity in high-volume barcode scanning. In counter weighing scale + bar code scanner interfaces are available on selected models from Magellan SL, Honeywell, Ohaus Adventurer, and Kilo Tech/Caszero. Flip-up weigh bar allows your cashiers to accurately weigh oversized produce, reducing shrink loss. Scale interface options for Digi SM100 to download product file sold by weight (grams, KG, etc) from Aralco Back Office Systems communicating via Ethernet. Weigh-price-label printing for produce, meat and deli SKUs with manual and auto mode during packing. These labels are interpreted by Aralco POS when scanned at the checkout to read the weight of the SKU or PLU and calculate the price per KG or 100 kilograms. Electronic shelf label (ESL) interface offers automatic broadcasting of product information, new SKUs, price c hanges, promotions from Aralco to the in-store ESL server which in turn transmit this inforrmation wirelessly to each electronic tag within the store. This interface works with any brand of ESL systems. Closed cash system interface at the POS for CashGuard from StrongPoint. With this integration, there is no need to organize till floats, count cash/coin or reconcile the till at the end of a shift as this is all done automatically by the systems. By displacing manual cash handling, cashiers no longer have access to the conventional "till drawer" and all transactions are calculated and administered by the system removing the risk of pilfering from the till and mistakes. Electronic signature capture device can be integrated with Aralco POS to capture the customer's signature on MS Word document templates such as sales or membership agreement. RFID tag and magnetic stripe reader options at the point of sale for staff login. Fingerprint reader interface from Aralco allows fingerprints to be used as an alternative to the user name, passwords, swipe cards. This feature eliminates "buddy punching" and improves your employees' accountability. Interface for Zebra card printer, ZXP3. In-store printing of membership, loyalty, and gift cards are supported at the POS or at any Aralco workstation. Supports user-definable design, font type/size, data and text fields, customer photo, images, bar-coded ID or magnetic stripe encoding. Bar code printer interface from Aralco supports all Zebra EPL range of bar code printers from desktop to industrial models. Bar code formats are fully user definable or customizable for regular labels, jewelry tags, and swing tags. Interfaces are also available for DYMO, TSC (TTP-247) and Label View. Stock count, Stock Receiving, Stock Transfer, Returns to Vendor, and Sales/Order Processing. People counting interface from Aralco is currently available in North America only. The POS is wirelessly connected to the traffic counter devices mounted on the store entrance. The POS receives the people count signal via radio frequency receiver, and its End of Day Report generates walk-ins count against actual transaction numbers at the point of sale. 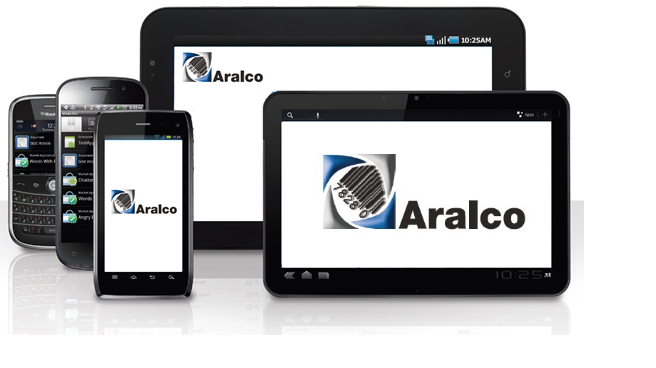 Aralco Mobile Systems runs on IOS, Android and Windows mobile phones or any hand-held computers, featuring a simple functional web-based POS highly suitable for event or pop-up stores, Inventory and Customer Lookup, Purchase Order and Stock Processing.